In all the “instrument” examples in the previous chapter, the methods in the base class Instrument were always “dummy” methods. If these methods are ever called, you’ve done something wrong. That’s because the intent of Instrument is to create a common interface for all the classes derived from it. In those examples, the only reason to establish this common interface is so that it can be expressed differently for each different subtype. It establishes a basic form, so that you can say what’s common for all the derived classes. 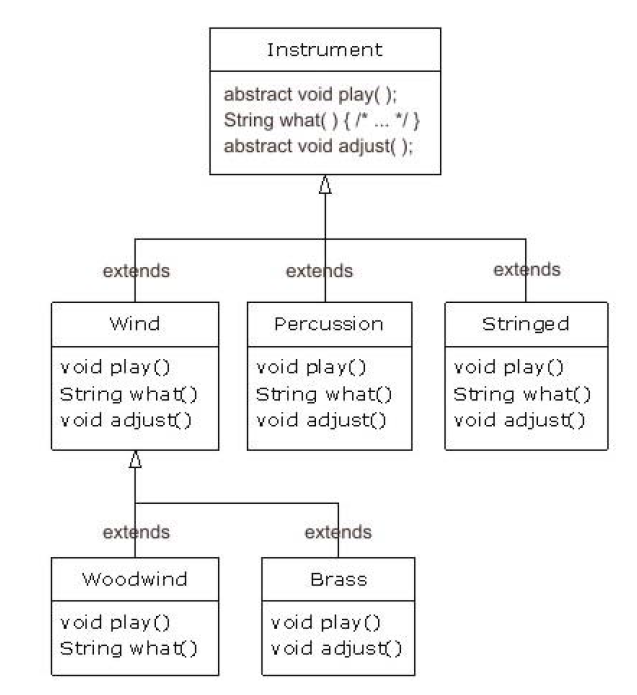 Another way of saying this is to call Instrument an abstract base class, or simply an abstract class. If you have an abstract class like Instrument, objects of that specific class almost always have no meaning. You create an abstract class when you want to manipulate a set of classes through its common interface. Thus, Instrument is meant to express only the interface, and not a particular implementation, so creating an Instrument object makes no sense, and you’ll probably want to prevent the user from doing it. This can be accomplished by making all methods in Instrument generate errors, but that delays the information until run time and requires reliable exhaustive testing on the user’s part. It’s usually better to catch problems at compile time. Java provides a mechanism for doing this called the abstract method. This is a method that is incomplete; it has only a declaration and no method body. Here is the syntax for an abstract method declaration. If an abstract class is incomplete, what is the compiler supposed to do when someone tries to make an object of that class? It cannot safely create an object of an abstract class, so you get an error message from the compiler. This way, the compiler ensures the purity of the abstract class, and you don’t need to worry about misusing it. If you inherit from an abstract class and you want to make objects of the new type, you must provide method definitions for all the abstract methods in the base class. If you don’t (and you may choose not to), then the derived class is also abstract, and the compiler will force you to qualify that class with the abstract keyword. It’s possible to make a class abstract without including any abstract methods. This is useful when you’ve got a class in which it doesn’t make sense to have any abstract methods, and yet you want to prevent any instances of that class. You can see that there’s really no change except in the base class. It’s helpful to create abstract classes and methods because they make the abstractness of a class explicit, and tell both the user and the compiler how it was intended to be used. Abstract classes are also useful refactoring tolls, since they allow you to easily move common methods up the inheritance hierarchy. The interface keyword takes the concept of abstractness one step further. The abstract keyword allows you to create one or more undefined methods in a class—you provide part of the interface without providing a corresponding implementation. The implementation is provided by inheritors. The interface keyword produces a completely abstract class, one that provides no implementation at all. It allows the creator to determine method names, argument lists, and return types, but no method bodies. An interface provides only a form, but no implementation. However, an interface is more than just an abstract class taken to the extreme, since it allows you to perform a variation of "multiple inheritance" by creating a class that can be upcast to more than one base type. To create an interface, use the interface keyword instead of the class keyword. As with a class, you can add the public keyword before the interface keyword (but only if that interface is defined in a file of the same name). If you leave off the public keyword, you get package access, so the interface is only usable within the same package. An interface can also contain fields, but these are implicitly static and final. 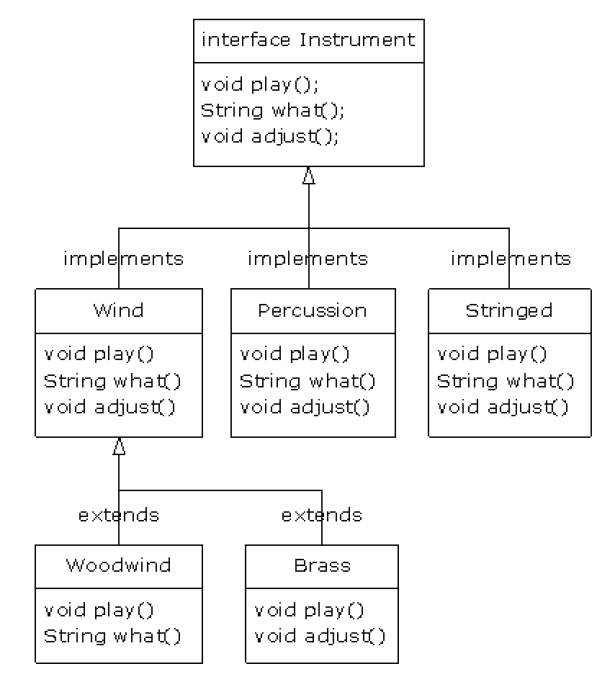 You can see from the Woodwind and Brass classes that once you’ve implemented an interface, that implementation becomes an ordinary class that can be extended in the regular way. You can choose to explicitly declare the methods in an interface as public, but they are public even if you don’t say it. So when you implement an interface, the methods from the interface must be defined as public. Otherwise, they would default to package access, and you’d be reducing the accessibility of a method during inheritance, which is not allowed by the Java compiler. One other change has been made to this version of the example: The what( ) method has been changed to toString( ), since that was how the method was being used. Since toString( ) is part of the root class Object, it doesn’t need to appear in the interface. The rest of the code works the same. Notice that it doesn’t matter if you are upcasting to a "regular" class called Instrument, an abstract class called Instrument, or to an interface called Instrument. The behavior is the same. In fact, you can see in the tune( ) method that there isn’t any evidence about whether Instrument is a "regular" class, an abstract class, or an interface. Whenever a method works with a class instead of an interface, you are limited to using that class or its subclasses. If you would like to apply the method to a class that isn’t in that hierarchy, you’re out of luck. An interface relaxes this constraint considerably. As a result, it allows you to write more reusable code. The Apply.process( ) method takes any kind of Processor and applies it to an Object, then prints the results. Creating a method that behaves differently depending on the argument object that you pass it is called the Strategy design pattern. The method contains the fixed part of the algorithm to be performed, and the Strategy contains the part that varies. The Strategy is the object that you pass in, and it contains code to be executed. Here, the Processor object is the Strategy, and in main( ) you can see three different Strategies applied to the String s.
The split( ) method is part of the String class. It takes the String object and splits it using the argument as a boundary, and returns a String[ ]. It is used here as a shorter way of creating an array of String. Filter has the same interface elements as Processor, but because it isn’t inherited from Processor—because the creator of the Filter class had no clue you might want to use it as a Processor—you can’t use a Filter with the Apply.process( ) method, even though it would work fine. Basically, the coupling between Apply.process( ) and Processor is stronger than it needs to be, and this prevents the Apply.process( ) code from being reused when it ought to be. Also notice that the inputs and outputs are both Waveforms. In this approach to Adapter, the FilterAdapter constructor takes the interface that you have—Filter—and produces an object that has the Processor interface that you need. You may also notice delegation in the FilterAdapter class. Decoupling interface from implementation allows an interface to be applied to multiple different implementations, and thus your code is more reusable. Without the Factory Method, your code would somewhere have to specify the exact type of Service being created, so that it could call the appropriate constructor. // A Game framework using Factory Methods. If the Games class represents a complex piece of code, this approach allows you to reuse that code with different types of games. You can imagine more elaborate games that can benefit from this pattern. In the next chapter, you’ll see a more elegant way to implement the factories using anonymous inner classes. It is tempting to decide that interfaces are good, and therefore you should always choose interfaces over concrete classes. Of course, almost anytime you create a class, you could instead create an interface and a factory. Many people have fallen to this temptation, creating interfaces and factories wherever it’s possible. The logic seems to be that you might need to use a different implementation, so you should always add that abstraction. It has become a kind of premature design optimization. Any abstraction should be motivated by a real need. Interfaces should be something you refactor to when necessary, rather than installing the extra level of indirection everywhere, along with the extra complexity. That extra complexity is significant, and if you make someone work through that complexity only to realize that you’ve added interfaces "just in case" and for no compelling reason—well, if I see such a thing I begin to question all the designs that this particular person has done. An appropriate guideline is to prefer classes to interfaces. Start with classes, and if it becomes clear that interfaces are necessary, then refactor. Interfaces are a great tool, but they can easily be overused.